Dollydust and Sequins: Dress of the Day! Goes to this beautiful creation!... Roksanda Ilincic, has kicked up a stylish storm with her new range of party dresses for Whistles, though at £325, it may have to be on the wish list, FOREVER. The collection hits www.whistles.co.uk and stores on the 10th November. For all those on a tighter budget, i will be browsing the high streets to find a more pocket friendly alternative... 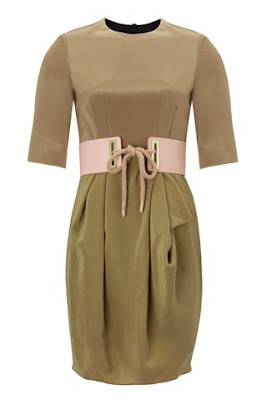 Think Camel pencil skirt, beige scoop neck long sleeve top, and pretty pastel coloured rope belt. Wala!